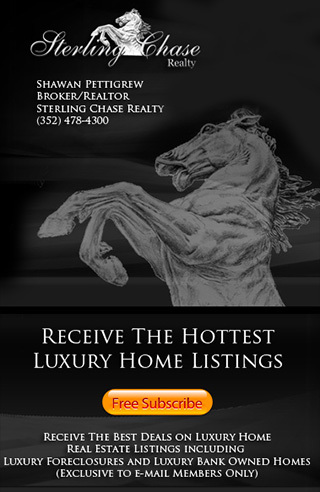 Sterling Chase Realty offers our members insider knowledge on Luxury Investment Properties that can be purchased for a fraction of their fixed up / completed value. Some of these Luxury Homes are new construction that just need finishing touches, others are distressed sales or homes that have been stripped of their appliances, cabinets and or HVAC's etc . PROPERTIES ARE DEEPLY DISCOUNTED AND READY FOR IMMEDIATE SALE! These properties are those that we would personally purchase if we had unlimited funds to do so. This privlidged information is only for our loyal customers and the people that are committed to working with us. If you are interested in finding out more on what homes are available and how to purchase any of these incredible investments, we ask that you introduce yourself to us to obtain login information so you can view these exclusive homes. Your privacy is respected, we never share your information. We will only use this to keep you updated on new properties as they become available. *Please note: Because of these homes huge upside potential most of these properties will go under contract in the first 72hours.